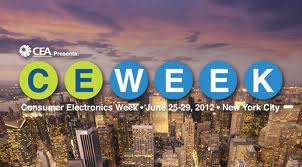 Come to New York City for a week of innovative technology, shows and exhibits starting June 24. CE Week is the consumer electronics industry’s week-long, citywide event bringing together major brands, innovators and start-ups to introduce their products to top media, analysts and technology thought leaders. Meet the companies (their developers, marketers and execs) that have created the products or services you’d want to buy. Showcasing technology for telematics, vehicle-to-vehicle communications and the latest apps for autos, C3 highlights the ways automakers are reinventing transportation. High-Tech meets High-Fashion with 3D printed fashion, smart fabrics, body sensors and wearable computing. Developers have the opportunity to show their apps to visitors on the showroom floor. The Showdown is a head-to-head live competition between apps in front of a live audience to vote for the best apps of the event. This summit explores the booming markets of next generation medical devices, remote monitoring, “mHealth” apps and products, cloud-based medical services, and wellness and fitness devices. Don’t miss this important discussion, led by renowned speakers in this emerging, high-profile field of digital health. Visitors can participate in a gathering of CE, Broadcast, Advertising and Content Holder executives and their service provider partners for a half-day of information, market statistics, education and thought leadership around the emerging 2nd Screen ecosystem. Exploring topics of: How to engage women customers; The true influence of women tech customers; Reaching women through social media; and What products women will want for holiday 2013. The conference program and exhibits are free to attendees. Last year the event drew over 6,000 members of the media, retailers and thought leaders from across the country. CE Week again features an impressive panel of technology leaders, from large corporations to innovative start-ups. These experts will demonstrate their new products, hold press conferences and networking events, and CEA will unveil mid-year market research and analysis. Key industry analysts, business leaders and columnists will be presenting exclusive data and insights in presentations and on panels.